The fuselage provides plenty of space for owners to develop fine details. The kit includes metal landing gear and raised torque tube drive system.This fuselage has full open doors design including pilot, side and cargo doors using our scale door joint hinges (kit included ). The fuselage is carefully designed utilizing computer 3D drawing and CNC mold providing extremely detail and precision scale panel lines. Customers can create their handcraft detail and build their own cockpit. This fuselage includes all the tail gear you need to convert your trex esp to the raised tail system. 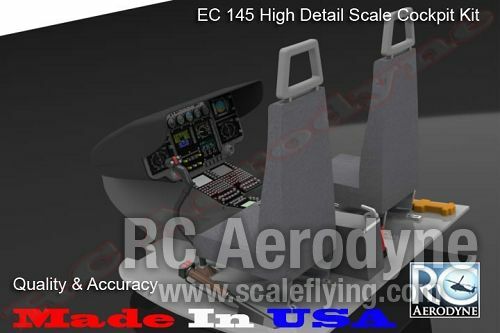 Highly Detailed EC145 Cockpit Kits. Designed from real CAD files on the EC145 and made to fit our fuselage. The Eurocopter EC145 is a twin-engine light utility helicopter manufactured by Eurocopter. Originally referred to as the BK 117 C2, the EC145 is based upon the MBB/Kawasaki BK 117 C1, which became a part of the Eurocopter line-up in 1992 when the company was formed through the merger of the Messerschmitt-Blkow-Blohm helicopter division of Daimler-Benz and the helicopter division of Aérospatiale-Matra. The EC145 is a twin-engine aircraft and can carry up to nine passengers along with two crew, depending on customer configuration. The helicopter is marketed for passenger transport, corporate transport, emergency medical services (EMS), search and rescue, parapublic and utility roles. The EC145 was a joint development between Eurocopter and Kawasaki Heavy Industries with the aim of significantly increasing the cabin space and take-off weight of the BK 117 C1, and upgrading the BK117's avionics in line with the systems developed for the EC 135. Type-certificated as the BK 117 C2, the helicopter was selected by the French Defense and Civil Guard for air rescue missions in December 1997, and 32 were ordered at a cost of one billion French francs. The first BK 117 C2 completed its maiden flight at Donauwrth on 12 June 1999, and a second prototype aircraft was built at Kawasaki's plant in Gifu. Eurocopter designated the new model as the EC145 with the third prototype in April 2000, and safety certification was awarded by the German Luftfahrt-Bundesamt and Japanese Civil Aviation Bureau in December 2000. The EC145 was shown at the Paris Air Show in 2001, and more civilian orders followed. Safety certification was awarded by the United States FAA in February 2002, and the helicopter was shown at the Heli-Expo event in Orlando, Florida in the same year. The latest variant of the model is the EC-145T2 which was unveiled at Heli Expo 2011 in Orlando, Florida. The EC-145T2 features an advanced cockpit design, modern avioncs, 4-axis autopilot and a Fenestron tail rotor. The new model will be equipped with new Arriel 2E turboshaft engines digitally controlled by dual Full Authority Digital Engine Controls (FADEC). The EC145 features a larger cabin space than the older BK 117 C1 helicopter with internal space increased by 46 cm (18 in) in length and 13 cm (5 in) in width, increasing cabin volume by 1.0 m (35 ft) to 6.0 m (211 ft). Other improvements over the older helicopter include an increased maximum take-off weight and increased range, achieved with improved rotor blades made of composite materials, based on the EC 135's rotors. These are combined with a hingeless rotor system with a monolithic titanium hub, and are powered by two Turboméca Arriel 1E2 turboshaft engines. The cabin can seat eight or nine passengers and has a level floor throughout with access from both sides and the rear of the helicopter. The all-glass cockpit consists of a Thales Avionics MEGHAS Flight Control Display System with active matrix liquid crystal displays. The cabin arrangement allows for one or two pilots with eight passengers in a club seating configuration, or nine passengers in a high density seating configuration. The EMS/casualty evacuation arrangement can carry up to two stretchered patients with three medical staff. The helicopter can be fitted with emergency floats, rescue hoist, search light, load hook and specialist equipment for other operational requirements. The French Sécurité Civile (Civil Guard), French Gendarmerie and the Landespolizei (State Police) of Hesse, Germany became the first operators of the EC145 when they received initial deliveries of the helicopter in April 2002. Two of the Sécurité Civile helicopters have crashed since delivery, with one being lost during a mountain rescue operation on Mount Arbizon in the French Pyrenees on 20 July 2003 and the other crashing during a police rescue exercise near Garvarnie in the Pyrenees on 5 June 2006 with the loss of three lives. In 2006, the "UH-145", a military variant of the EC145, was selected for the United States Army's Light Utility Helicopter Program, beating three other helicopters. The deal involves the supply of 345 helicopters, with options for additional aircraft. The total value (including service and maintenance) is approximately $3 billion. 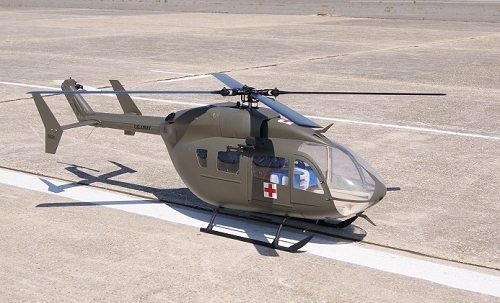 The planned 345 helicopters have been designated UH-72 Lakota by the U.S. Department of Defense for the United States Army. The first UH-72A was delivered in December 2006.